Families often face difficult and painful losses, and we want to help. If you have a death in your family or need to reach out, please contact us. 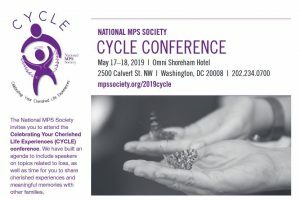 The National MPS Society invites you to attend the Celebrating Your Cherished Life Experiences (CYCLE) conference to support our bereaved families. This conference will be held on May 17-18, 2019 at the Omni Shoreham Hotel in Washington, D.C. Please visit the link below for more information. We hope you find these links to information helpful in your journey. If you have resources to add, please contact us. Disclaimer: the National MPS Society offers these suggested sites for additional information; however, inclusion in this list does not constitute any real or implied endorsement of their content by the Society. This program provides support groups and information for family members after the loss of a child. BPUSA hosts an annual family conference for support. This program provides support groups and information for family members after the loss of a child. Information regarding state and local support is available. This network was created for and by parents, and provides support, information, and knowledge bases around issues of parenting and caring for children with illnesses, as well as bereavement and loss support.